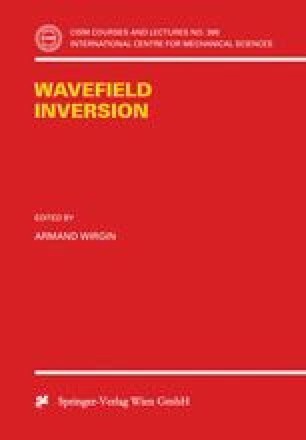 The essential features of several rigorous and approximate methods for solving a large class of inverse acoustic wave scattering problems are presented herein. The rigorous (and near-rigorous) methods, which are very computer-intensive, involve solving linear (for the field) and non linear (for the boundary and composition parameters) boundary integral (BIE) and domain integral equations (DIE). The only way to reduce the computational volume, in order to obtain near real-time inversions, is by employing approximate models of the wave-medium interaction. Approximations appealing to complete family of functions representations, perturbation theory, heuristic arguments or asymptotic analysis, are described which often enable a closed-form expression for the scattered field to be obtained. This field ansatz is explicit in terms of the boundary and composition parameters. The latter are then determined from a set of equations that are usually non linear. When, however, the equations are linear, the inversion can be carried out by some sort of inverse (e.g., Fourier) transform. The multiplicity of solutions is demonstrated and the repercussions of model error (leading, for instance, to complex solutions for real parameters) are brought into evidence.